This group carries out a quiet but important ministry of prayer support for parishioners and others in special need and for situations of concern to members of the congregation. 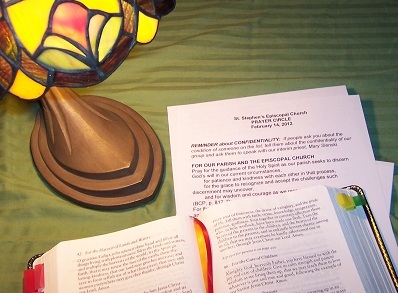 Circle members agree to practice the discipline of regular prayer for the persons and situations on our list and to maintain strict confidentiality unless we have specific permission to share a concern with the congregation. The only requirement for inclusion in the circle is a willingness to commit to this discipline. Currently the circle meets at 11 a.m. on the second Thursday of every other month to discuss the experience of regular prayer and to update our prayer list. (Some of us stay for the noon Eucharist.) Between meetings the list is updated by email, phone, and U.S. mail. This notification system makes involvement in the circle open to those who would have difficulty attending a daytime meeting. To inquire about joining the prayer circle or to submit a prayer request, call the church office at 812-232-51621 or click here to email either the rector or the prayer circle coordinator.